The bells will be rung half-muffled this evening for the annual bereavement service. This service is open to all, particularly those who have lost loved ones recently. In addition to the bells being half-muffled, we will be ringing the middle 8 of our 10 bells. This produces a “dorian mode” scale, which is as close to a minor scale as possible. The Staplehurst band won the local method ringing Striking Competition for the 6th consecutive year. A much closer call this year, with the team in second place trailing by only half a fault! Thursday 8th September – National Ringing Moment at 6 p.m. until 7 p.m. A Quarter peal will be rung to mark the start of this national event. Friday 9th September – By appointment only between 7 p.m. until 9 p.m. – Ringing demonstrations and tours of the tower. Saturday 10th September – Church and Belfry tours between 10:00 and Noon, then 14:00-16:00 with bell-ringing demonstrations. Sunday 11th September – Church and Belfry tours between 15:00 and 17:00 by appointment only. This will be followed by a quarter peal to mark the end of the Heritage Open Day weekend. If you would like to attend any of the “by appointment sessions” or have any questions about ringing please email towercaptain@allsaintsstaplehurst.co.uk. Around a dozen people came to our first recruitment session on Sunday, everyone enjoyed a tour up to see the bells and to see them ringing. The majority of people even had a go at ringing for the first time and showed great promise. We look forward to seeing even more at the next event which is this Friday morning. At All Saints’ Church we have a successful band of ringers and are always on the lookout for new recruits, to keep this tradition going. 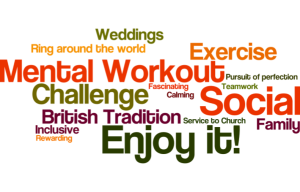 Bells don’t automatically ring for services and weddings, it takes a team of people ringing together to achieve the sound that we’re all used to. Ringing is open to all ages from about 10 upwards, and is a great thing to do with the whole family. There is no obligation to attend services. Our regular practice is from 19.00 to 21.15 every Tuesday evening. Anyone is welcome to come up and see what goes on. We can also be found in the Kings Head from 21.15 to late. We’re normally the big table of people, don’t be afraid of coming and having a chat! We are also offering a few occasions where the tower is open on other occasions, these are listed below. The first two will be principally for tours of the tower, where you can see the bells, get a little history of the tower and bells, and if you want, have a go at ringing. The second two sessions will be the same, but with a focus on giving people a chance to really start to learn to ring if they want. 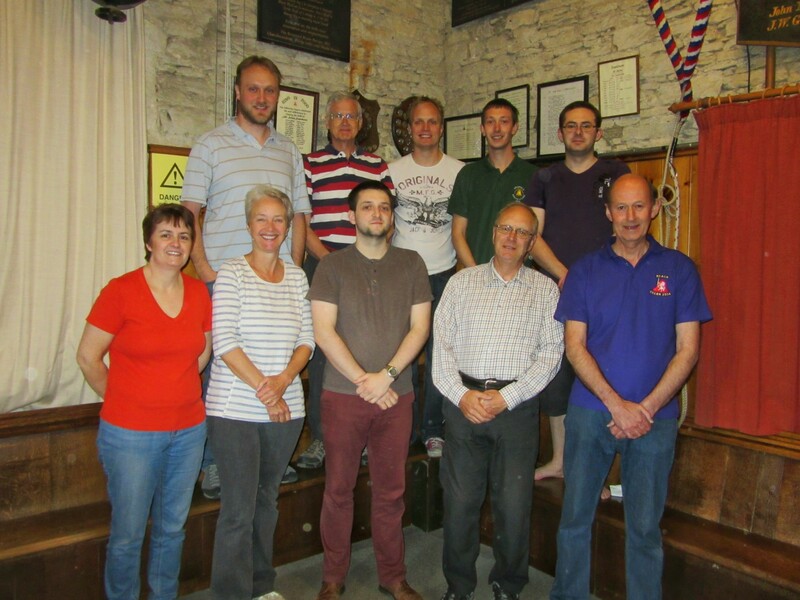 At Staplehurst we are lucky to have several very experienced teachers of ringing, the majority of which have been or currently are involved with organising ringing and training in the local county association. All ringers involved in teaching young recruits hold current DBS clearance. Learning to ring isn’t something that happens overnight. There are several sections you will learn in turn, before putting these all together. Depending on how often you practice, this phase of “learning to handle” can take as little as a week, but don’t be put off it takes longer. As with driving, once you are able to handle a bell safely, you will then continue to gain confidence the more you ring, or the more “rope miles” you get. If you would like any more information, please contact Tower Captain – Daniel Brady. This Monday, Staplehurst hosted a Plain Bob Minor practice on our simulator. This enabled our “students”, from Boughton Monchelsea and Marden, to ring with some experienced ringers on silenced bells. Everyone progressed really well, with some people advancing as far as ringing touches for the first time by the end of the evening. This Year the Friends of All Saints’, Shepherd’s Market featured a display of Christmas Trees from various village organisations. Amongst these were offerings from Brownies, Guides and Nursing Homes. 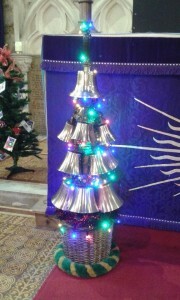 This is the bell ringer’s entry, featuring our 12 hand-bells. Our thanks to Chris and Sue for putting it all together. 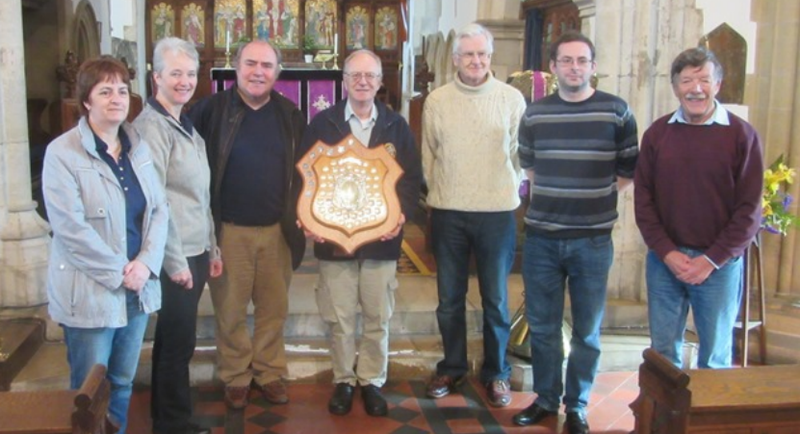 On Saturday 18th of April, ten local ringers took part in the 100th peal to be completed at Staplehurst. This peal comprised 5000 changes of Plain Bob Royal and took exactly three hours to complete. First of Royal: 1, 6 & 7. There will be an additional practice on Thursday 9th April from 10.00-12.00, all abilities very welcome. If you’re a non-ringer who’s interested in what goes on, why not pop along too! Staplehurst entered teams into both the Method and Call Change Striking competitions today. We were placed first in both categories. Congratulations to Ightham also, the host tower, who were placed a close second in both.